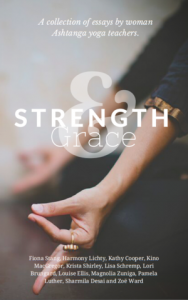 As soon as Ekaminhale started advertising bite-sized snippets of Strength & Grace on social media and via email, I knew I wanted to read more. I impatiently contacted Clint at Ekaminhale and commented on most of the Facebook posts. I wanted to read this book! “The book is a collection of essays written by established Ashtanga Yoga practitioners- all female. They reveal how they have maintained their Ashtanga Yoga practices as they journey into various stages of life. Through the recollections of these exceptional women, we are given a glimpse of how powerful – and healing – the Ashtanga system can be when practiced with wisdom and patience. I can’t say which chapter or writer was my favourite, but I found myself scribbling and nodding most of the time. Each described their relationship with either Sri K. Pattabhi Jois (endearingly known as ‘Guruji’) or Sharath Jois with such love and respect. They describe their devotion to their teacher in an inspiring and touching way. Words such as surrender, peace, fear, and change all resonated with me. The preface by Alicia Beale explains why she sought to create a book that didn’t already exist. She was struggling with injuries whilst practicing Ashtanga Yoga and was wondering if the practice was really meant for women. This book shares stories of each individual woman and her experience with the practice – through injury, motherhood, menstruation and frustration. Some give tips and instructions on how to modify your practice and how to heal your practice. Others are open and honest about their pain and suffering. I love this book, and I recommend it. I know I will read and re-read it many times over.